Mix a cup of cashews with a cup and a half of water in the blender. Add chicken seasoning, onion powder, and lemon juice and blend until smooth. Add more water if needed. Set aside. Into skillet, mash or dice tofu. Add the rest of the water, yeast flakes, and flour. Pour blender mixture into skillet and cook with tofu until thick. 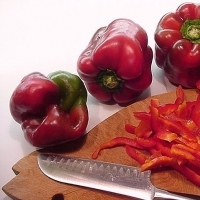 When scrambler is through cooking, add bell peppers. Warm flour tortillas in microwave or steam them in a double boiler. Fill them with scrambler and place in a baking dish folded seam side up. Pouring the enchilada sauce over them will help keep the folded seam closed. Mix together all ingredients. Pour sauce in two-inch strips over enchiladas; cover and bake in oven for about fiteen minutes at 350°. Sprinkle with Benton Sisters' white jack cheese. Recipe courtesy of the Benton Sisters.